In the jungle you must stand up for yourself or else be eaten. It's a pretty straightforward scene. I think we all encounter this from day to day. The feeling of predator and prey. Bravery is something we constantly relearn. I empathize with Mowgli's need to belong, her loss of innocence. The pain she must experience in order to define herself. These are themes which resonate for me. My greatest love has been the collaboration between the young actors and the adults. It is a challenge and a delight to work with so many age groups and levels of experience. The young people have brought a wonderful freshness to the process which set the tone for the rehearsals. The adults have accepted the younger folk into the pack and we've formed a very unique ensemble. I've worked with all of these students in the past and it is marvelous to watch them step up to the challenge of this show. The time commitment alone would have scared many kids away. Applause and thank yous go out to these young actors for their bravery and commitment as well as to their parents for supporting this project. 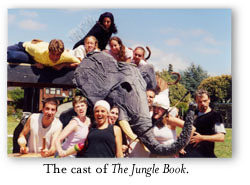 Every spring I put on a play with my students at King Middle School in Berkeley. I try to involve as many students as possible, so I search for scripts that could have multiple parts - I also look at scripts that I think will hold the interest of 11-15 year olds; both the performers and the audience. I never find these scripts. Instead I turn to classic literature and adapt it for the stage. I am grateful for the opportunity to expand on this work and revise it for a larger audience with Shotgun Players. I find that for these adaptations, going back as much as possible to the original work - both in terms of content and form - is the best approach. These works are classics for a reason. I found in re-reading the Kipling that the story was very appropriate to the age I work with, as the issues are identity - Who am I? To which group do I belong, if any? - shifting allegiances, prejudice, betrayal, loss, love, survival and violence - and if that"s not adolescent stuff, I don"t know what is. On a larger level, I think the problems Mowgli faces and confronts opens us as an audience quite directly to issues concerning the outsider in any society. Mowgli's story touches all of us and therefore, I think, deepens our understanding and empathy for the outsiders in our society. And if theatre can do this, it has done something worth doing. Besides, it's a cool story. Enjoy.